Ivory Petal Flower Chandelier Shade - This darling kids' chandelier shade is covered with a delicate ivory silk. Pretty ivory flowers are scattered around the fabric for a sweet, feminine look. The sequin flower centers add a bit of sparkle to this chandelier shade. We recommend a 25-40 watt bulb for all chandelier shades. 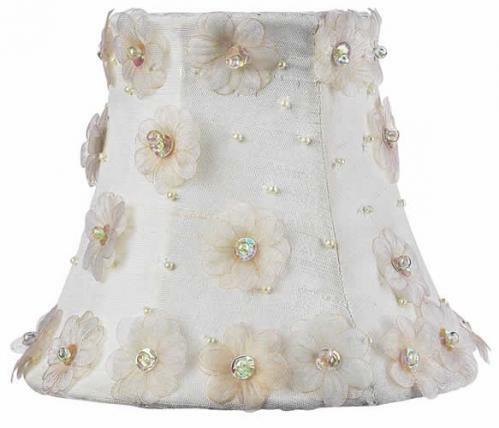 Dimensions: 3" x 5" x 4.25"
Full Description Ivory Petal Flower Chandelier Shade - This darling kids' chandelier shade is covered with a delicate ivory silk. Pretty ivory flowers are scattered around the fabric for a sweet, feminine look. The sequin flower centers add a bit of sparkle to this chandelier shade. We recommend a 25-40 watt bulb for all chandelier shades.